Micro Air's low-pressure, high efficiency spark arrestors are engineered to channel hot embers and sparks into a baffled drop-out chamber, diverting them away from the filters, thus reducing the risk of a fire. 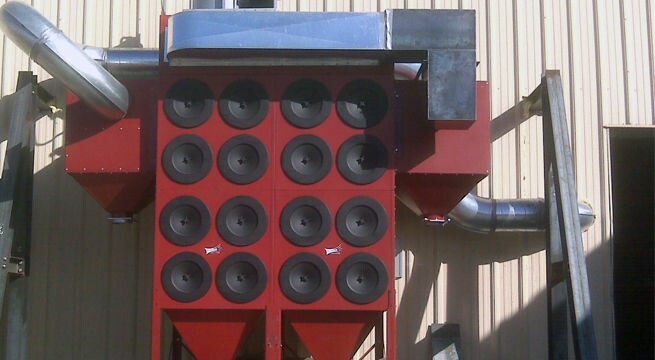 Spark arrestors can be mounted to the side of the dust collector or mounted in-line of the duct work and are available in either a horizontal or vertical configuration, providing the versatility to fit into any installation. 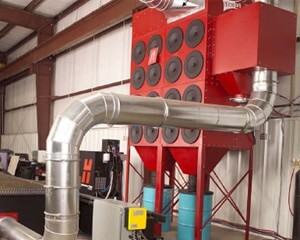 Micro Air® SA2000V, mounted to the side of RP dust collector, and ducted to laser table protects your equipment, reduces the chance of fires and protects your employees by capturing sparks and hot embers prior to entering the dust collector. 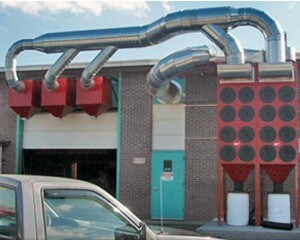 Micro Air® SA4000H, multiple horizontal spark arrestors mounted in-line of ductwork capture sparks, greatly reducing risk of fire.